Recently Hayk Papikyan has developed a passion for his computer, scanner and a program called “AREV” and is eager to show off the way by which the combination of the three are making his life more enjoyable. “Look here,” he says carefully grouping the keys. “I am scanning the page of the book, then launch AREV and that’s it. It reads for me.” And even scanning the book is method made simple by AREV. Hayk Papikyan and his tools for "seeing". AREV is a recently developed, unprecedented computer system in Armenian language for the blind. The brainchild of scientists of the Yerevan Computer Research and Development Institute (YCRDI), the program allows the blind to use Armenian websites, communicate via e-mail or listen to books or other information. Hayk, age 22, is one of 18 who completed AREV lessons organized by the YCRDI. He lost his sight when he was 14, after complications with influenza. Despite the unexpected problems, he strongly decided to continue his education. Hayk moved from the ninth grade of his school to a Yerevan boarding school for blind children, where he learned the Braille system. Upon finishing school he successfully passed three university exams and now he is at the second course of the history faculty at Yerevan State University. 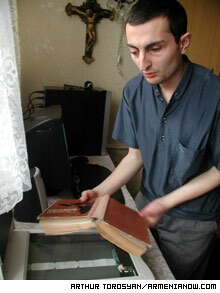 Hayk writes down the lessons in a Braille notebook or records them on tape recorder. But apart from learning those lessons he needs to become familiar with more extensive literature, including the classics and professional literature. His mother has been helping him, by reading literature and university books for him. Arman Kuchukyan, creator of AREV and the Technical Director of the YCRDI says that it took two and a half years for his group to develope the program. Kuchukyan says he does not diminish the value of Braille system. He says it has been a perfect aide, but it now outdated. “Only few books are available in Braille in Armenian or in Russia. It is unfair that blind people were deprived of an opportunity of reading other books. The systems like AREV are available in West for a long time, and I am happy that we managed to make the similar program for Armenians,” he says. 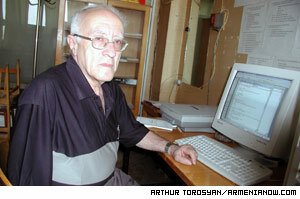 Kuchukyan, 73, has worked at the YCRDI for 51 years and says that AREV is one of the institute’s best achievements. He is inspired by AREV, but is unsure about its future. “We organized the computer lessons for the blind people free of charge and gave AREV programs also free of charge to those few who had computers at home. What about those who do not have computers? They will forget soon what they learned,” he says. Kuchukyan applied to the Parliament asking to assist in providing computers the school graduators. Kuchukyan says a lot of Armenians can benefit from the program. But Kuchukyan’s good intentions were not favorably met by government. The All Armenian Fund "Hayastan" has allocated six computers to the boarding school for the blind children N 14 and AREV program was installed in those and other computers there. Currently there are 120 students studying at the school from grades 1-11. It is the only school of its kind in Armenia, except for the school for the children with poor eyesight. In all there are 4,000 blind people in Armenia and most of them are involved in production of electronic houseware. Hayk Papikyan who completed massage courses at the boarding school says that before entering university he tried to find a job of a masseur, but he could not find any vacancy.